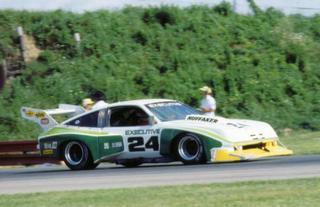 At the end of the 1974 season, the IMSA Camel GT Challenge had grown into a recognized road racing series. With full grids, sponsors and growing crowds showing up at every race, the future of the series looked bright. The problem was, from the beginning of the series, one make did dominate and always won : Porsche. They had ready-to-race cars available to every well-financed racer and they sold it. As a result, races often ended up as Porsche parades. BMW had entered the fray in 1976 and you could find your American iron at the start of every race but with no success to be awaited. At that time, Chevrolet was conscious about this problem and was willing to change that situation. Vince Piggins, who was heading Chevrolet's Product Promotion Engineering Department sent a proposal to John Bishop. Clearly, this proposal was to allow tubeframe chassis on racecars, it was a blueprint for the creation of a silhouette category allowing a greater liberty for building American race cars, as seen in other forms of GT racing in the US. This proposal stirred John Bishop who was quite all ears at the perspective of a Chevrolet versus Porsche competition : it looked as the perfect promotion for his series. A new category was to be created : the All American GT. The spearhead for Chevrolet would be the all new Monza. A brand new model revealed at the end of 1974, this model was narrower and smaller than any other model Chevrolet built. It would fit perfectly to this new category. As Chevrolet would produce some restyling for this racer-to-be, it would be obvious that further development for the cars would be delegated to independant shops. Dekon Engineering had already proven their ability in building race cars. Horst Kwech and Lee Dykstra had begun developing a neat and effective race car. A robust tubeframe chassis coupled with the suspension which was a fabricated A-arms in front and a 4-link Panhard-bar in the rear with a Ford 9-inch axle. Add a fiberglass bodywork that you can easily remove and you have your easy to tune or repair racecar. The car was fitted with a V8 Chevrolet 6,0L given for 570hp. It was mounted on 17 inch-wide wheels. It could reach top speeds in excess of 180mph. Dekon was an acronym as "D" stands for Design and "K" for construction. The car was to be debuted at Road Atlanta in 10th April 1975 and would be driven by Horst Kwech himself. A race that would terminate in a shunt with a slower car. He had qualified fifth overall, which was quite good but could not make it to the grid for the second heat as the car needed heavy repair. The car had proven its capabilities, however, as the winner, Al Holbert, driving a Porsche Carrera RSR, saw it would make a winner and ordered his Monza for the 1976 season. The next 1975 races turned into engine problems for the Dekon Monza, and the car could not fight with the Porsches or BMWs. A second chassis was built for Harry Theodoracopoulos, but it was wrecked during a practice session and sent back to Dekon, where it was repaired and updated. One of the updates the car got was an extra bar, running from the main roll hoop, and down to the passenger footwell area. They named this extra bar the “Harry bar,” because they were worried he’d need the extra bracing for his next big wreck. At that moment, it seemed clear to Vince Piggins that Horst should probably concentrate on the mechanical part of the development. He accepted it reluctantly, and later admitted that it was the right decision. For 1976, a new engine supplier was found and several new chassis had been built and sold to different teams. It seemed that it would be the perfect year to demonstrate the Dekon cars real potential. Al Holbert had taken delivery of his new car and Michael Keyser had purchased one. They won seven of the fifteen races they entered and Al Holbert won the 1976 title. In 1977, he would do it again facing a stronger opposition. Porsche was allowed to run its 934s and BMW had entered a fantastic 320 Turbo in the capable hands of David Hobbs that proved fast, if not always reliable. Al Holbert had developed his car, now displaying a big rear "banana" wing and the car proved even more effective. Unfortunately, it was to be the last IMSA title for a Dekon Monza, as in 1978, the rules would allow Porsche 935s, cars that would dominate the series for a while. Monzas would still be seen on the Camel GT circuit, but would never win a race anymore. Here are the cars seen on the Camel GT circuit from 1975 to 1981. #1001- The first AAGT car, driven by Horst Kwech.